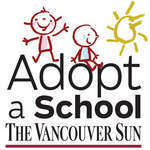 Pleasant Valley Elementary School in Nanaimo is asking for an Adopt-a-School grant of $3,200 to provide healthy lunches and snacks to 15 children from low-income families. This project is designed to address the need for students to have enough nutrition in order to focus on learning at school each day. It also helps to ensure they have a balanced meal (especially including protein and fresh fruits and vegetables) and some variety to support healthy growth.